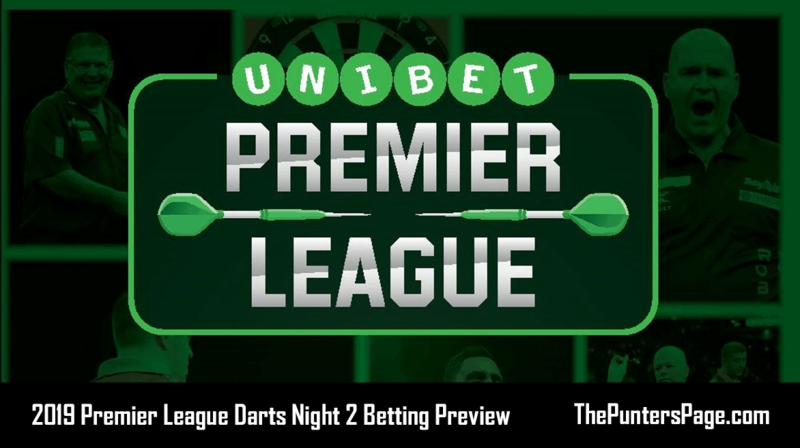 Darts expert Tom Beresford (@Tomsportsjourno) assesses the 2019 Premier League Darts outright market and provides us with his best bets ahead of Thursday’s curtain raiser. Michael van Gerwen the World no.1 and reigning three-time World Champion is the obvious favourite at 13/25 to win the Premier League for the fifth time. The Green machine scooped the £500,000 jackpot at Alexandra Palace on January 1 as he claimed his third World title. 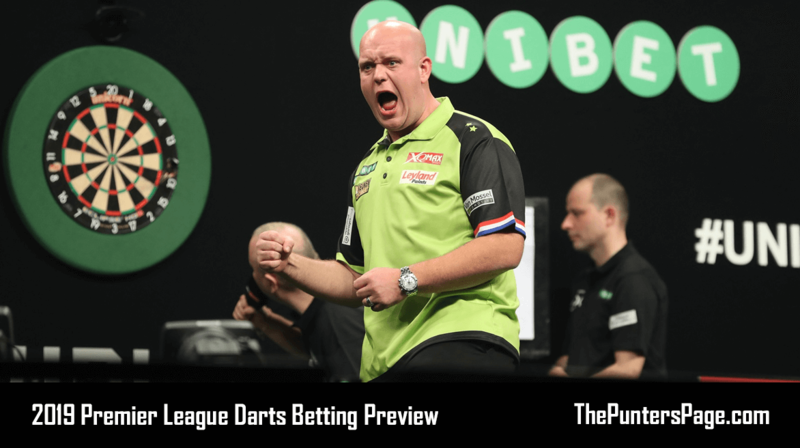 In 2018, Van Gerwen shown signs of vulnerability as he suffered defeats to Jeffrey de Zwaan at the UK Open and the World Matchplay in the early phases of those events. Van Gerwen came back to win the Grand Prix prior to that win at Ally Pally. For MVG, despite those defeats in those major events in the first half of the year, the World no.1 still picked up 20 PDC ranking titles in 2018. Following the announcement on Monday that Gary Anderson had to withdraw from the 2019 Premier League due to a back, injury, the PDC decided to award spots for nine ‘contenders’ for one night only. The contenders won’t earn points towards the league table, but it seems the criteria that the PDC have used is in terms of location. One night one, Bedlington’s Chris Dobey will take on Mensur Suljovic in Newcastle. Also, three-time World Champion Glen Durrant will play in Glasgow, Steve Lennon in Dublin, Luke Humphries in Exeter, John Henderson in Aberdeen, Nathan Aspinall in Nottingham, Max Hopp in Berlin, Dimitri van den Bergh and Jeffrey de Zwaan in Rotterdam over two nights. The decision from the PDC was a major talking point on Monday across social media. My outside tip for the Premier League has to be Michael Smith. 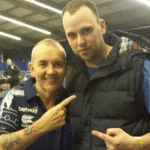 The St Helens star reached the Premier League final in 2018 as he was heavily defeated by Michael van Gerwen, but Smith really came into some form following that defeat. ‘Bully Boy’ picked up his first PDC televised title at the Shanghai Masters back in July, he then reached the final of the World Series of Darts finals, and most impressively, Smith fired his way to the World Championship final as he was ousted by MVG, but he really did open up some great opportunities to win his first world title. Michael Smith is 15/2 to lift his first Premier League crown. The 2018 World Champion Rob Cross is the third favourite at 10/1. Cross hasn’t really found his top form since winning the World Championship just over 12 months ago, but ‘Voltage’ gave a great account of himself on his Premier League debut. Peter Wright is surprisingly further down the outright list, the former World Championship, World Matchplay and Premier League finalist is surprisingly priced at 12/1. In recent times, Wright’s been out of form, but he’s always a threat. ‘Snakebite’ missed six darts to win the Premier League title back in 2017, and he’ll be hungry to avenge that defeat. For me, Mensur Suljovic is excellent value at 22/1 to lift the Premier League title. The big Austrian is very capable on his day, Suljovic reached the World Matchplay in 2018, and after a fairly successful year, he competes in the Premier League for a second successive year. Daryl Gurney, the 2017 Grand Prix and 2018 Players Championship winner, can be found at 40/1 heading into the start of the Premier League. For me, that’s a huge price considering the talent that ‘Superchin’ possesses. Gurney does blow hot and cold at times, but in form, he’s one of the strongest scorers in the game. James Wade, who had a superb end to 2018 following his two big televised wins on-the-spin at the European Championship and the World Series of Darts finals will be full of confidence after making his return to the Premier League stage. Wade’s of course a Premier League winner back in 2009, and you can get Wade at 40/1 to lift the Premier League title. Gerwyn Price has been a major point over the past few months for different reasons, but the controversial Welsh star will be looking to really have a good run during the upcoming Premier League campaign. For Price, the Premier League didn’t really work out, but after winning the Grand Slam of Darts in November, the Welshman is brimming with confidence, and at 50/1 he’s certainly worth a punt. Five-time World Champion Raymond van Barneveld has also been talked about at great lengths following his inclusion in the 2019 Premier League. RVB is ranked outside the World’s top 20, but after announcing his retirement from the sport at the end of 2019, Van Barneveld was included in the line-up for the Premier League. Van Barneveld has been an iconic figure in the darts world, and he was really the player that put the Netherland on the map from a darting perspective. RVB is available at 50/1 to lift the Premier League title for a second time following his win back in 2014. Michael Smith came runner-up in the 2018 Premier League, and the World Championship. I really think that he’s a great price at 15/2 and most certainly worth a punt. Mensur Suljovic is my recommended each-way recommendation to lift the Premier League title. The Austrian came runner-up at the World Matchplay and he’s a PDC Major title winner, so 22/1 each way is a great outside bet to go for. Sports journalist and tipster specialising in darts. Podcast host, producer and darts commentator. Influenced by the late Sid Waddell. For more sporting news visit tomsportsjourno.com.